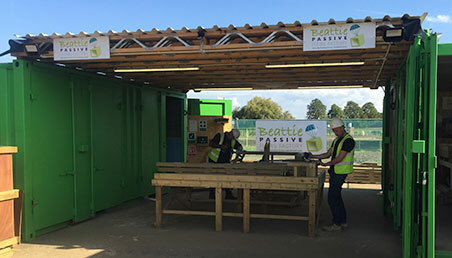 The Beattie Passive system achieves superior levels of energy efficiency compared with both traditional and existing modern methods of construction. The innovative system builds beyond even Passivhaus standards. The wall and roof is constructed with 300mm deep twin studwork. The airtightness layer is applied to the inner face of the structural frame and the frame is protected with 12mm or 9mm fire and racking board. An internal service void is created with 25mm batten to enable easy access to services around the building. On the external face of the structural frame another layer of 12mm or 9mm fire and racking board is fixed. Breather membrane is wrapped around the building and a 25mm batten is applied to provide a suitable substrate for any external finish and a drained and ventilated cavity. The Beattie Passive System provides complete flexibility for external finishes, for example render carrier board, brick slip carrier board, timber cladding, or full brickwork, amongst others. The system is pumped with insulation beads to provide a continuous insulated layer. The roof system (whether cold or warm roof) is exactly the same construction, delivering a very high u-value and continuous insulation. 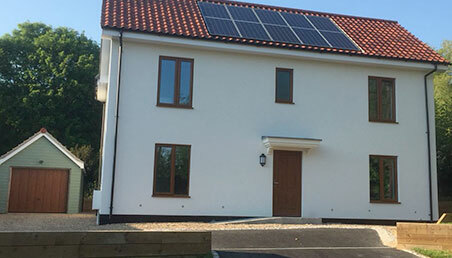 Most Passivhaus systems require a Passivhaus foundation system which can be very expensive. 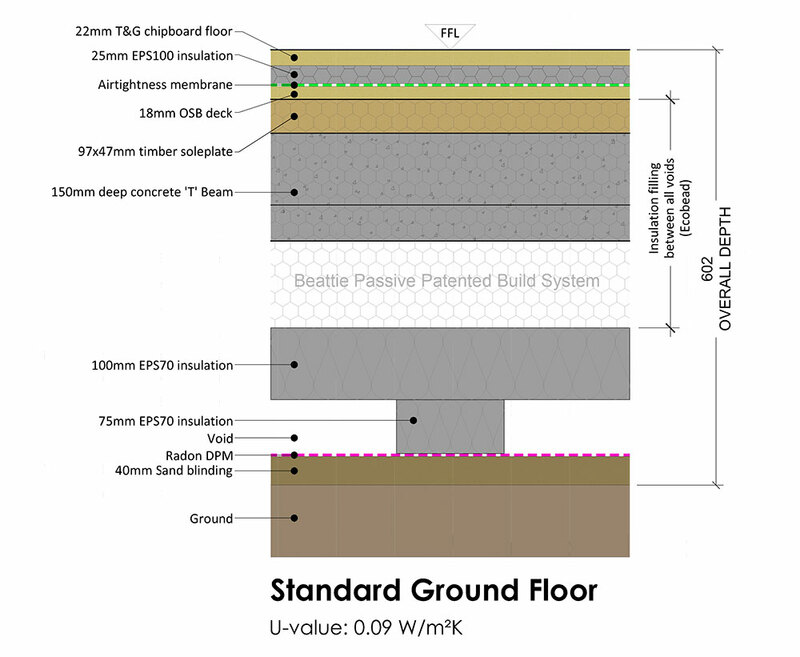 With the Beattie Passive ground floor detail, we are able to continue the insulation from the wall in to the floor void completing our continuously insulated structure. With this in mind, much more cost effective foundations can be used, usually strip foundations designed by us but supplied by your local ground worker. As part of our design, we also ensure every project is flood and radon protected as well as ventilated protecting the structure for the life time of the building. Beattie Passive is the only company to have a continuous Passivhaus system (from ground floor, to walls to roof). Our patented system enables the insulation to flow around the whole structure and means there are no gaps or joints. High performance cavity insulation is applied on-site by skilled installers to guarantee the delivery of a continuous insulated building that is tested by thermal imaging. Due to our unique patent we are the only company who can deliver continuous insulation around a building. The injected EPS Eco-bead insulation is made up of small round balls stuck together with a water based additive – beads: 98% steam and 2% recycled oil). We used Eco-bead as it doesn’t slump when wet, has high thermal properties and is A rated in the Green. 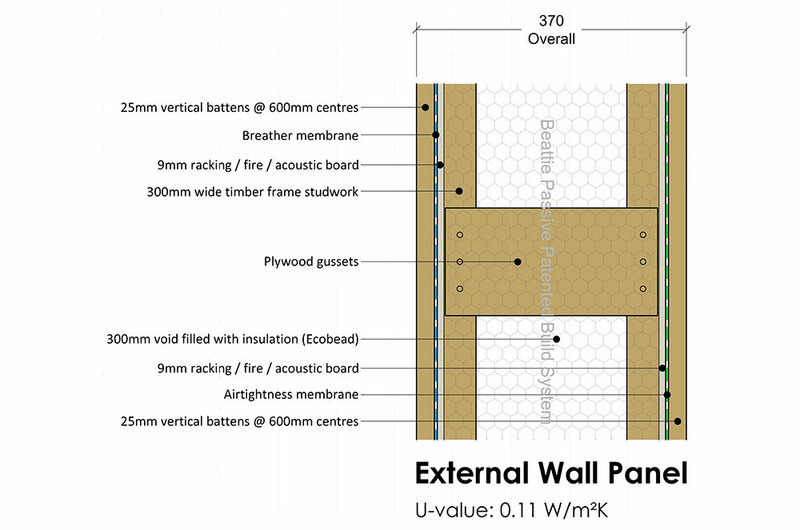 Beattie Passive's design methodology details each junction for air tightness and achieves levels of 0.60m3/hm2 (@50pa). The system has continuous insulation within the walls, floor and roof, guaranteeing Passivhaus standards and significantly outperforming SIPs and other build systems. All structures are independently air tested and thermally imaged to provide clients the peace of mind that we have delivered the designed performance. A U-value is the measurement of heat transfer through a given building component, which is particularly important in achieving the desired energy efficiency levels of Passivhaus build. All our walls, floor and roof construction details have been tested with hot box testing and Passivhaus modelling. The lower the value, the better the insulated building. Convection looping occurs when warm air from the inside hits the cold air on the outside of a building, it rises and convects, pulling more warm air to the outside. There are three main causes: cold bridges between timber studs and at junctions on walls, floors and roofs; gaps between insulation at abutments; poorly fitted insulation in cavities. Beattie Passive's build system overcomes any issue with convection looping due to its continuous insulation seal. No gaps, no looping, no loss. The Beattie Passive system has been developed to achieve the best possible acoustic performance, at least three times better than building regulation requirements. The system is proving highly popular for sites located close to schools, busy roads, train lines and flight paths ensuring that you can enjoy the peace and quiet of your Beattie Passive home. Acoustics are also particularly important for terraced houses and apartment buildings. The independent party wall and ceiling designs give high levels of sound proofing up to 65db; this is six times better than Building Regulations Standards. The Beattie Passive envelope is designed to deliver a high level of fire performance. The timber structure is clad internally and externally with non-combustible material, offering 2-hour protection between dwellings, in comparison to build regulations of 1-hour. By replacing OSB boards with fire and acoustic boards, the fire resistance is greatly increased. This is over twice the protection afforded by almost all other build systems and has been independently tested to 147 minutes to one side by Exova’s Warrington fire test centre.